Pixar crafts a handful of unique animated films every year, and it’s no surprise they’ve pushed far beyond a milestone of 25 years in business. This milestone ushered the publication of a Pixar 25th Anniversary Artbook featuring color scripts from all of their major films. 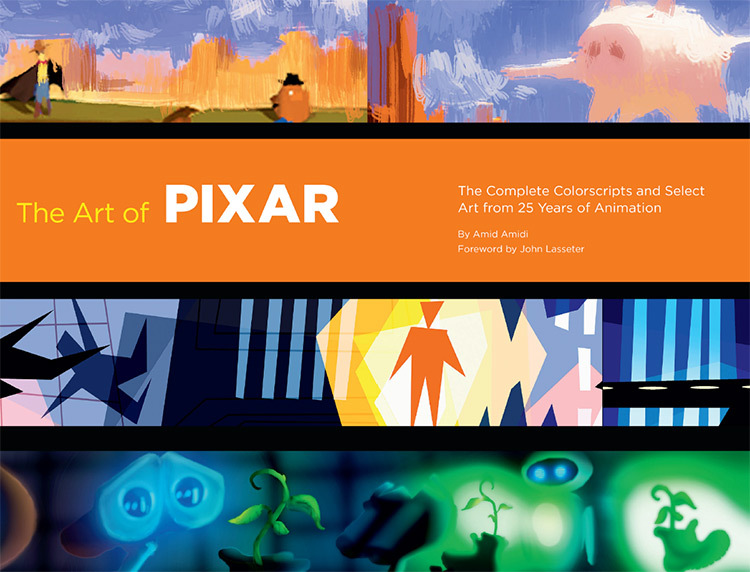 The book’s full title is The Art of Pixar: 25th Anniversary: The Complete Color Scripts and Select Art from 25 Years of Animation. This includes a ton of examples of color scripts but you also get to see related production art too. I was surprised to find out this book was authored by Amid Amidi, the editor-in-chief of Cartoon Brew. He has industry experience and years of writing for that site covering animation & cartoon news, reviews, opinions, and interviews in great detail. Amid is one of the best choices for authoring this huge Pixar compendium. The first thing I noticed is the book’s’ depth and weight. The Pixar 25th Anniv. book has 320 pages of glossy artwork. The page binding is thick and the book material is also very high quality. It has a well-written forward by John Lasseter and covers some of Pixar’s most notorious films like Toy Story, Cars, Up, and Finding Nemo. Most of Pixar’s biggest movies already have their own artbooks so I was skeptical about the 25th anniversary book. I assumed it would be a watered-down version of all the individual art books crammed together. But it’s actually a unique collection of production artwork giving you an even greater peek behind the curtain of the animation industry. Note that a good majority of the book contains color scripts. But there’s also a good 100+ pages of single-page production art. These singular pieces of artwork were still used in production, mostly sketches or rough concept paintings made for the animators. So this may not literally be the “complete” collection of color scripts. But it’s certainly the biggest collection of Pixar color scripts to date printed in a single book. I really enjoyed the full-page preview of these color scripts against a black background. It helps each panel jump off the page and catch your attention. I also have to admit that while the production art is beautiful, a good portion of the content can be found in other Pixar books. For example The Art of Finding Nemo has a lot of the same content and even includes some color scripts that aren’t published in this 25th anniversary book. But you do get lots of unique never-before-seen color scripts from other Pixar movies. Ratatouille has a lot of production art in this book that you won’t find anywhere else. Same with Cars and Up, two classic Pixar films. The films run in sequence with the earliest being Toy Story(circa 1995) and the most recent being Cars 2(circa 2011). The content in this book will delight any Pixar fan. It has lots of inspiring production artwork beyond the typical color scripts. And it’s the perfect book to start collecting animated artbooks if you’re looking for coffee table books full of artistic inspiration. I should start by explaining the actual definition of a color script. This term is generally related to Pixar, although most animated movie studios create their own color scripts/color keys. This task is given to the visual development team who are responsible for designing the style, mood, tone, and color palette of each film. 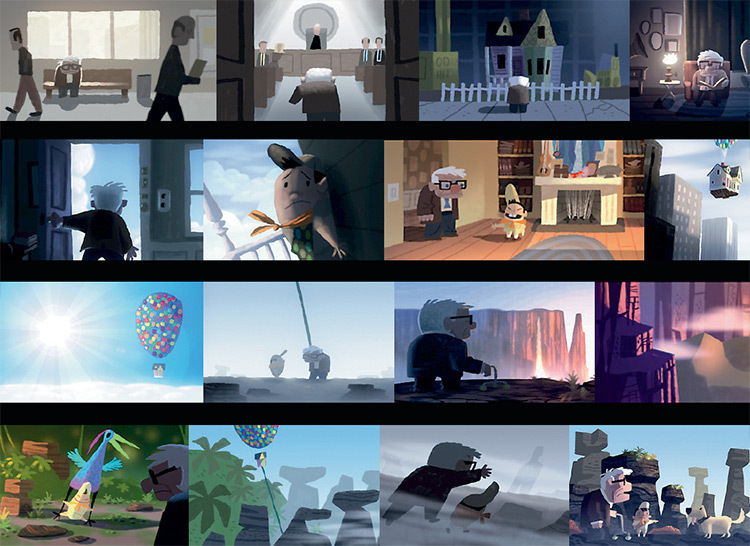 A color script consists of a series of panels that rough out the story of the movie. Each panel is usually pulled from the storyboard and rendered in a specific way to define the aesthetic style and color palette of each scene. Check out this guide to learn a bit more. These color scripts portray emotion, mood, lighting, and other cinematographic elements that give the viewer an enjoyable experience. Color scripts date back to the original Toy Story movie during the early 1990s. Pixar’s 25th Anniversary artbook includes these color scripts along with information about each one. Each color script is printed in high quality and organized by movie date. You get hundreds of individual pages of color scripts totalling thousands of panels. This 25th anniversary book was ultimately created for animation buffs and artists who love to see this rough production art. Just because you enjoyed Ratatouille doesn’t mean you’ll love the 5 pages of raw production art and color scripts. You have to genuinely enjoy the artwork behind the making of these movies to get real value out of this artwork. But this is ultimately one of the best books you’ll find with rare pre-production animation artwork. Artists may be surprised to find that many of the color scripts don’t match perfectly with the final production. Vis dev artists often work out their own styles with added depth and texture to the color scripts. The large variety of artistic style can be very inspiring but also somewhat confusing. If you’re open to any type of art style then you’ll love the nature of this book. I think this is one of the best artbooks for illustrators and comic artists who find inspiration in highly stylized artwork. I’ve always enjoyed Disney more than Pixar but this 25th anniversary book got me hooked. I grew up on movies like Toy Story so it’s incredible to see all this rare production art in one place. The Pixar 25th Anniversary Book is a beautiful collection of rare production art spanning over two decades of animation history. If you have any interest in the field of animation then you should definitely grab this book. I’d also recommend it for anyone looking to do illustration or concept art for cartoony projects. This may not be as useful for artists looking to do realistic video game concept art but it can still be a fun addition to your bookshelf or coffee table collection. Ultimately I’d say this is a worthwhile purchase if you have any interest in the entertainment industry. Even if you don’t like Pixar there’s a lot to learn by studying the artwork in this massive 320 page artbook. And if you’re looking for more specific Pixar content check out our collection of the best Pixar artbooks. People who only like 1 or 2 Pixar movies will be better off grabbing the individual artbooks for those movies. It should be noted that if you already have a majority of individual Pixar artbooks then this 25th anniversary compendium won’t have much new content. It still might be worth adding to your collection, and it’s a cheaper alternative than buying individual art books for every movie. But I think this will appeal more to animation buffs and people who don’t have many “Art Of Pixar” books in their collection yet. What is a Visual Development Artist?